Yay! Advent is my favourite season in the church calendar, and it’s almost here! Actually, Lent was pretty cool this year, too, with our superduper Lent with Kids series, but the inspiration for that came from all the fun and surprisingly helpful things we did at home during Advent. So here we are! I wanted to get this series started with plenty of time for people to think and prepare, rather than just starting when Advent starts, which in 2016 is Sunday, 27 November. A couple of years ago I wrote out a bunch of ideas for celebrating Advent, for adults and for kids, and you can check it out here: Anticipating the Anticipating. I thought it was time for a comprehensive post with everything you need to get excited and prepared for Advent, so here goes! There’s something for everyone, I hope, including people without their own children, so read on and pick a couple of things that appeal to you. The cheat-sheet version: Advent is the church season that runs for the last few weeks before Christmas. It starts four Sundays before Christmas Day (whatever the date), so in 2015, it begins on Sunday, 29 November. In churches, Advent is often celebrated each Sunday, in kind of a countdown way, where you’re counting down to Christmas. In homes, people often expand on that with Advent calendars and other ways of marking off each of the 30 or so days. Advent lasts a different number of days each year because it always starts on a Sunday but Christmas Day falls on a different day of the week each year. Advent is about two things: anticipating Christmas, and putting the story of the baby born in a stable in the broader context of the Big Story of God’s work in our world. The story doesn’t start with Jesus being born. Matthew and Luke are the biographers in our Bibles who tell the ‘traditional’ Christmas story: shepherds, angels and so on. Matthew begins his account of Jesus’ life – before mentioning the wise men or the star, let alone the miracles and parables – by putting him in the context of his whakapapa, his family line. He gives a symbolically patterned genealogy stretching back to Abraham, showing that Jesus’ arrival fits in with God’s whole plan for Israel and the world beyond. Luke goes back even further, giving a fuller whakapapa back to Adam, and God, and then telling the story of Jesus’ baby cousin John before we even meet Mary and the angel. That’s why many Christian churches start the countdown to Christmas four weeks before, with Advent. We get ready to celebrate Jesus, reminding ourselves of the bigger plan he is a part of, and of how much the world was anticipating him even before Mary was waddling around with swollen ankles. Everything I’m going to suggest will be about either counting down to Christmas – capturing a sense of anticipation – or about putting the story of Jesus’ birth in the context of the Big Story. I’d love you to add to the list with other ideas, resources and links in the comments. You can even add a photo if you like! This was by far the biggest part of our Advent last year, and was the jumping-off point of the Lent for Kids rituals we invented to follow on. Most kids love candles, right? It’s traditional in many churches to light five candles, usually arranged in a wreath, one for each Sunday of Advent, and one for Christmas Day. There are lots of different patterns of Advent candles to choose from, with different names, colours and themes for the candles. See a range of options here, here and here (or just follow mine below!). So we did our own version at home, based on the pattern of Advent candles we did at the church I was pastor at before my son was born: green for hope, blue for peace, yellow for joy, red for love, and a central white candle for Christ, to be lit on Christmas Day. My little one, nearly two years old, enjoying the Advent candles. That’s him in the video three years later. Whatever colour your candles are, you light them each day (at dinner time worked best for us), accumulating as you go. So for the first week, you light the green candle each night, and then in the second week, the green and the blue, and so on. You add the new candle each Sunday. This is one of my very top recommendations for Advent with kids. The structure of lighting the Advent candles one by one last year, when my son was just two, gave us the opportunity for repeated conversations that ended up creating our own theology-for-toddlers. Of course he only had a glimmer of understanding about what this all meant, but can you imagine how that will grow if we do the same thing every year of his childhood? This is the kind of spiritual foundation I really want to build for him. So the candles are definitely coming out again this year. We use a candelabra because I’m too lazy for a wreath, but you can do a version that is as simple or elaborate as you like, of course. Check craft shops for wreath-making supplies and craft or gift shops for a range of coloured candles. Go for big candles, remembering that the first one you light will be lit 20 or 30 times! Also, think ahead to where you will be throughout Advent. If you’re heading out of town for Christmas, you might want to consider how portable your arrangement is – or have a backup set of small candles to take on your travels. My son loved his Canterbury Cathedral Advent calendar (a gift from his very attentive English godfather) so much that we kept it and looked at it every so often through the year. How they work: each day or night, a child gets to open the next little door in the calendar, to reveal a picture that helps fill out the Christmas story. The Cruelty-Free Shop does a dairy-free one. Fishpond imports the Divine one (out of stock as I write, but I imagine they’ll be available soon). Chocolate aside, Advent calendars that tell the Jesus story in some way aren’t too hard to find, but might be drowned out by Father Christmas and snow (doubly irrelevant in the Southern Hemisphere) in many mainstream shops. Try googling for a nearby Christian bookshop, or go to your closest cathedral or large church that has a gift shop and you should be in luck. There are plenty of options online of course (I’ve just spotted Lego Advent calendars and a whisky version – not in the same calendar, mind you, so someone’s missing an opening in the market). This is a lovely opportunity for people who don’t have kids of their own to be involved in Advent with someone else’s kids. Coordinate with parents, and go hunting for a cool calendar you can present to a small person you know. You could even phone them each night (or sometimes) to ask what was behind the next door and have a little conversation. The ritual can be as brief or elaborate as you want to make it. Our boy had such a good time that it became quite a big deal. We would look at all the windows he’d already opened, talk a bit about the ones he was most interested in, open the next one, and maybe follow that up with a longer story (from a book or our heads) about where that symbol fitted in the Christmas story. You could tie it to Bible story readings or other books pretty easily – though you may not know ahead of time what’s coming up yourself! If that appeals, there are some Advent calendars (like this one I spotted online but haven’t explored myself) that come with a book of extra resources to help, so keep your eyes peeled for one of those. If you’re both crafty and keen, you could always make your own Advent calendar to suit your situation. For Advent calendar ideas, Pinterest is your friend (whether you’re a member or not – though if you like this kind of thing, why on earth aren’t you on Pinterest?). Go to Pinterest.com and type ‘make advent calendar‘ in the search box. Click on one you like and go down the rabbit hole for instructions and ideas. Or here’s one collection of 25 different creative calendar variations if you want to bypass Pinterest. Screen shot of Pinterest Advent Calendars search. Here is Adriel Booker’s list of 150 Advent activity ideas for more. Have any of you made your own Advent calendar of any kind? Got some pics you can put in the comments or send me? I’d love to see! See my post on letting kids know they have the power to change the world for more ideas. And if you have more to add, please leave a comment below. You can also make the most of gift-giving with these 47 ideas for Christmas gifts that make the world a better place. And if this heading appeals to you, you can also check out Advent Conspiracy, a movement trying to reclaim Christmas from the clutches of consumerism. A Jesse Tree works on a similar principle to Advent calendars. You make or draw a tree – anything from an elaborate fabric creation to a piece of paper on a wall – and once a day during Advent, you discover the next symbol and put it on the tree. Stacey’s Jesse Tree with symbols attached. The main difference is that usually a Jesse Tree counts down to Christmas by telling the stories of Jesus’ famous ancestors from the Old Testament. For all you need to know about Jesse Trees, see Stacey’s wonderful guest post about how her family does it, with lots of links to other resources. If you’re more a story kind of person than a make-and-do person, a great easy option is reading one story every day from a Jesse Tree book. The one I know best and recommend is by Geraldine McCaughrean. This is a collection of stories of Jesus’ ancestors, one for each day of Advent. All the work done for you! The lead-up to Christmas is full of baking and cooking opportunities, and most kids love to pop on an apron and help in the kitchen. You could make treats of any sort for gifts (suggest your favourites in the comments, eh? ), or do some kind of special seasonal baking for giving or eating. Special bread for St Lucia’s day, anyone? Last year in our house instead of an actual Jesse Tree book – the McCaughrean one was a bit old for our 2-year-old – we followed (well, we started to) this plan of Old Testament Bible stories which was also handily based on the chapters of the Jesus Storybook Bible. The reason we didn’t end up following it much is that I’m of the opinion that much of the Bible should be R16 and isn’t that suitable for young kids – including many of the stories that are most commonly told to children, like David killing Goliath and Abraham almost sacrificing Isaac. That’s a whole nother topic though, so I’ll just leave it to your discretion to figure out what stories to tell. Or if there’s popular demand, maybe I could come up with an alternative Old Testament not-too-gory story list… Let me know what you think. There are lots of great Christmas story books around, from ones telling the straight Nativity story to others drawing on themes of Christmas, or telling the story from an alternative perspective (a cat in the stable or the donkey carrying Mary). You could make a special Advent reading corner where all your Christmassy books live. Or if you have enough books – get in early to the library and you might be in luck – you could even count down with one each bedtime, especially if you alternate with a children’s Bible story collection. I’ve written a separate post listing and reviewing Christmas picture books that feature Jesus, so take a look, and take the list along to your local bookshop. One of my very favourite things to do in Advent is to put out the Nativity scene. We have a set of wooden figures from Trade Aid (who usually have a great collection, and purchasing from here or somewhere similar means your money supports fairtrade business projects in developing communities – a very Christmassy thing to do). Our figures are pictured in the graphics for this series (I had a lot of fun getting them out early to photograph). You can download some figures to colour in and use from Strandz. 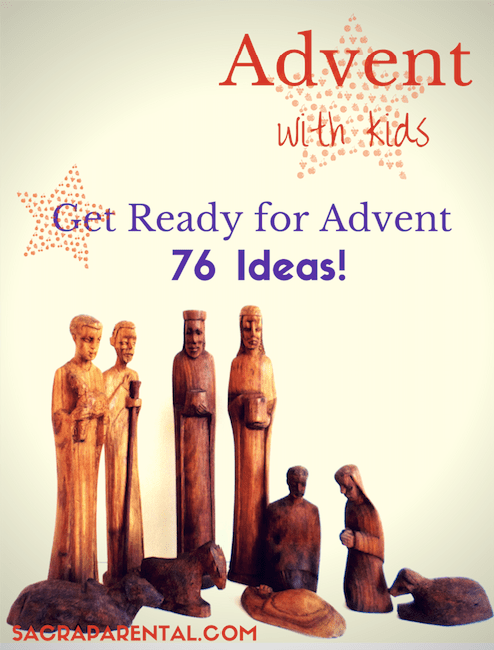 There are few different ways you could use the figures throughout Advent. You could either set them all up as a family activity one day, or you could heighten the anticipation by doing it gradually, adding a new piece every few days, or a new set (the shepherds and sheep; the wise men) each Sunday, with Baby Jesus not arriving until Christmas Day itself. Another cool variation is to have all the pieces out, but travelling through the house throughout Advent. Mary and Joseph might travel from Nazareth (the kitchen?) to Bethlehem (the mantelpiece or coffee table?) over the course of the month, and the shepherds might start in their fields (do you have some pot-plants inside, maybe, or some green Lego to make some grass for the sheep?) before being visiting by angels and sent to the stable. The wise men probably visited last – maybe even a year or two after Jesus was born, given the reaction of King Herod – so they might need to start all the way by the front door, slowly crossing the desert to see Jesus and his family… Maybe they don’t arrive until 6 January, the traditional date of Epiphany, marking their visit. Children could also just lie on the floor and play with the figures! Figure out what will work best for your household, but there’s lots of fun to be had, so I strongly recommend making a big deal out of a Nativity set. Last year Chris said his family – including teenage kids – read a book aloud through Advent, a chapter at a time. Their usual was Jostein Gaarder’s The Christmas Mystery, and comes recommended by other commenters, too. Another option that springs to mind for households with older kids is Charles Dickens’ A Christmas Carol. I found other recommendations online (just google ‘Christmas chapter books’) but didn’t find things that I had read myself, so I think that’s the end of my own recommendations. I’d love to hear your ideas, though, so add them in the comments! Every year the marvellous Mark Pierson, wherever he’s based at the time, puts together Advent in Art, a curated collection of five pieces of art that tell the Advent and Christmas story. There’s a matching set of reflections and readings and ideas for further action. The resources are primarily printed cards, but also available online at adventinart.org – the site goes live when Advent begins. You can sign up there for weekly email updates. In 2014, the featured artist was one of my favourite painters, He Qi. Annunciation, He Qi, used with kind permission, all rights reserved. Visit heqiart.com. These are wonderful resources for reflection for adults or to use with children. Ask some questions as kids look at the details in the painting and let them ask you questions. Nativity, James B Janknegt, 2002, oil on canvas, reproduced with kind permission, all rights reserved. I’ll be going through this year’s Advent in Art series too, so please do feel free to join me. You might like to sign up at the top right for email updates whenever there’s a new post here, or follow Sacraparental in some other way, if you want to keep up with Advent in Art or Advent with Kids posts (or anything else). I’m keen for your input into this one. I’ve newly discovered the useful resource site, Common Sense Media that rates and recommends all sorts of media for kids. But their ‘Holiday’ list is pretty heavy on snow and Santa, and full of things I haven’t seen myself. But check it out – there are still some gems there. Possibly better for our purposes is their list of movies that inspire kids to change the world! My favourite Advent movie isn’t for kids (except maybe older teens): check out my earlier post on Children of Men. Other commenters recommended Love Actually, The Nativity, Lord of the Rings and The Matrix (and the Die Hard movies…) when we were talking about Advent movies, but that was a discussion among adults, rather than recommendations for movies to watch with kids. So: hit me with your ideas, please! Leave a comment with your favourite Christmas/Advent movie that’s suitable for children. Thanks! Make an Advent wreath (several different ideas for different ages) and then optionally put some candles in it (see above). Make pretend Advent candles if the real deal is too risky for your household! Explore traditional St Nicholas stories with craft activities. Make simple Christmas tree ornaments. And of course, if you’re early enough, make your own Advent calendar – 25 ideas collected here (phew!). I’m not advocating shops playing carols – or worse, songs about Santa – in August, but I do like bringing out my own collection of Christmas music in December. Whatever you’re into, I bet there’s a Christmassy something you could find. We have a couple of world music Christmas collections from Putumayo, and Handel’s Messiah will definitely feature, as well as this New Zealand contemporary collection and some actual carols. I stumbled across this enormous list of hymns and carols with Advent themes if that interests you. Depending on your hemisphere (and other factors), Christmas carols may be most appropriate in Advent (if you’re in the Southern and heading away on holiday at Christmas) or after Christmas (more common in the North, where the holiday period is shorter). But wherever you are, there will probably be a carol service you could attend – try ringing a big Anglican church if you’re not sure where to find a service – and maybe even a Carols by Candlelight gathering outdoors (is this mostly a summery Southern Hemisphere tradition?). Or sing at home, with the help of a piano, a stereo, YouTube or just your voices. Remember that singing – especially with other people – has been shown to improve mood and be generally great for your health! Share your singing with others: go carolling with kids around the neighbourhood, or in a hospital or rest home. How’s that to get you started? There’s so much room for more, though, and I would really appreciate you leaving a comment with tips and ideas from your experience. Please feel free to keep in touch with Sacraparental throughout Advent by following Sacraparental on Facebook (daily extras), signing up for email updates (the box at the top right) and/or following me on Pinterest (the Advent board will be particularly relevant just now!). And please leave your ideas in the comments below. Oh no I want to do them all! I get so excited that it is easy to overcomplicate things in a very busy period. This year I found Jesse tree ornament printables that are based on the JSB, (http://joyfullyweary.blogspot.co.nz/2011/11/our-advent-calendar.html) previously, I have done the Jesse tree from 3 different bibles and read advent calendar stories and done the advent wreath! I have also ordered Jotham’s Journey a storybook for Advent – I haven’t read it myself yet but it came up when I searched for books for advent and looked at the right level. I also prefer to do Chrismons ornaments (which I hang in rows from the ceiling) rather than a tree with traditional ornaments. Brilliant! Look forward to hearing how the Jotham book goes. I like the ceiling idea – we don’t do a Christmas tree, and that sounds like a lovely alternative. My brother has used Stephen Croft’s book ‘The Advent Calendar’ with his kids since they were 5 and 7. They’re 9 and 11 now and still very keen on it. It has daily stories that relate to why Jesus came (but in a fictional way – not a Bible story), each connected to a verse from Isaiah. We don’t have kids but used a copy as a couple one year and appreciated it as a one-off, but it wasn’t good enough to make it an annual ritual so we passed it on to a family at church with lots of kids. It isn’t based on the actual dates of advent for a particular year, it simply starts on November 30th. It’s British (my brother lives in Scotland) so not sure how available it is here, but I did see it on the Wheelers website for $30. Oh, good recommendation, thank you! Is this it? Looks great! We found a felt advent calendar at the school fair. My husband and I made little figurines out of modelling clay (three or four at a time throughout the Advent season because we didn’t get round to it earlier) which became part of a nativity scene centred around a little clay stable that a friend with Down syndrome had given us. There were some angels, a star (which we blu-tacked onto the roof of the stable), sheep, shepherds, camels, magi etc, in more or less random order, finishing with Mary and Joseph and finally the baby Jesus for Christmas morning. The figures were about half the size of my little finger, with a sausage for a body and a ball for a head. My husband was especially proud of his little donkey. We’re looking forward to using them again this year. That sounds fabulous! Nice work, team! Thanks, Mel! Will check them out! Thanks so much for sharing our ideas here! I’m off to check out the other links as well. Like you, Advent is my very favorite, followed closely by Lent. I love this! Thank you, Thalia! Two chapter books to read with children that I absolutely ADORE are “The Best Christmas Pageant Ever” & “The House Without a Christmas Tree”. Both are funny and unexpectedly touching. I did not know what advent is but I am not Christian but at least I learned a few things! Thanks.